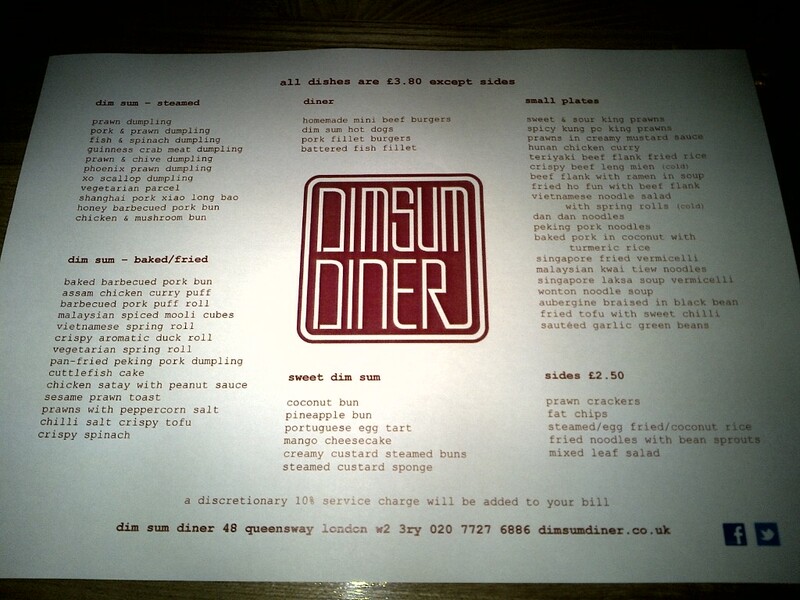 A few weeks ago I wrote about a little place in Queensway that I was really excited about and even commented that Dimsum Diner could give Ping Pong a run for its money. You can obviously imagine how overjoyed I was on Thursday to be out and about with dinner plans and nowhere to eat. I quickly suggested we try Dimsum Diner and the next thing I know we were walking down Queensway looking for the restaurant. We walked in to the restaurant which was sparsely populated with just two other diners. Obviously visiting a restaurant so early in its existence is always going to be a slight issue as you can never tell if the place is empty because the food really is that bad, or because it has simply done a bad job at publicising the place. A friend had once commented that its always best to wait for the place to get a little more established before taking the plunge and visiting. Obviously I chose to ignore this opinion when picking Dimsum Diner. We were given a selection of possible tables and picked one right away. It would seem that canteen style restaurants are becoming quite popular as once again we were greeted by wooden tables with benches, plain white floor tiles, red walls and a bar in the back corner. Being regular Dim-sumers (yes that is the technical term for regular Dim Sum eaters) it was easy to pick out the dishes we wanted from the menu. When the waiter came to take out drinks orders, we reeled off our food choices and asked him to bring it as soon as possible. 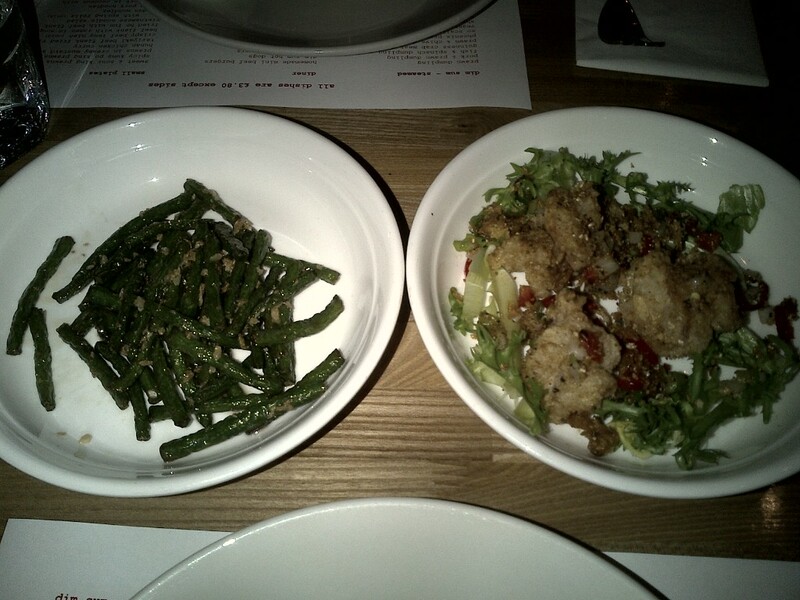 First to arrive were the sauteed garlic green beans and the prawns in peppercorn salt. The prawns were cooked in a thin batter type coating and then covered with peppercorn salt. Having tasted numerous namesakes of this dish, I can only describe it as average. Furthermore with only 3 pieces provided in a portion, I’m not embarrassed to say it was a rather stingy portion. The green beans were noticeably shrivelled which could only really mean that they were overcooked. The sauce was quite nice with a subtle garlic flavour. Miss R did however comment that there was a distinct similarity in the taste of both the prawns and the beans. Next to arrive was the Malaysian spiced mooley and the Dim Sum hot dogs. I must say, I am a general fan of mooley cakes served at Dim Sum restaurants although I’m not always so keen on the dried meats that are generally embedded within. On the whole I was quite keen on the mooley cubes despite the fact that the Malaysian flavour was virtually non existent. The Dim Sum hot dogs however were a disappointment. When I read the menu, this was one of the dishes I was most excited about and if it had been innovative by way of both flavour and presentation, it would have been given a thumbs up by me. 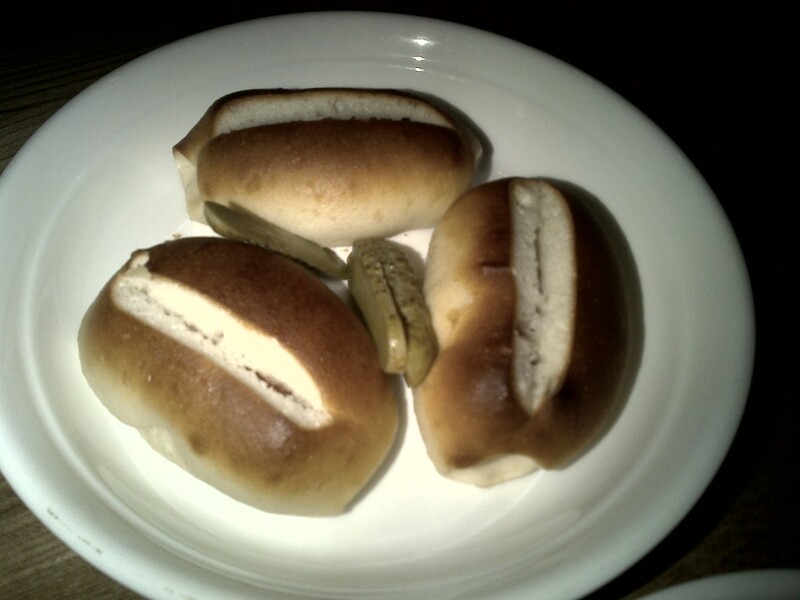 However the Dim Sum hot dogs were simply 3 miniature buns stuffed with bite sized hot dogs, served with two baby gherkins. Not at all impressed!! Last came the three steamed delicacies. Our tower of steamers consisted of 3 pieces of the prawn dumpling, 3 pieces of the xo scallop dumpling and 3 pieces of the honey barbequed pork bun. The prawn dumpling, also known as har gau was as good as any other har gau I’ve tasted. It was hot and seemed to hold together fairly well. The XO scallop dumpling was actually really nice. It was a pretty regular dumpling but had a dollop (I like that word) of xo sauce on it. The sauce, in my opinion, enhanced the flavour of the dumpling ten fold. The honey barbequed pork bun or char sui poa were our least favourite. From her first bite Miss R found a piece of far, whilst I appreciate that pork is known to be fatty, its not often that your able to pick out whole pieces from char sui buns. Following this experience Miss R was slightly put off (shocking given that it is one of her favourite Dim Sum). Taking from Miss R’s unpleasant experience, I broke my bun apart using my fingers before eating it and was also able to pick out a piece of fat. Despite our fatty incident, the buns were pretty standard. The reason why Ping Pong has excelled at taking over the all day Dim Sum market is because they serve fresh Dim Sum and have a few innovative flavours on the menu. Whilst Dim Sum Diner may one day achieve some individuality, innovation need not be its key aim at present. The food on the whole wasn’t at all bad but as my dad always says, you go to a Chinese restaurant to eat Chinese food, not American food and the same can be said for Dim Sum Diner, a little bit ambitious for now but if they stick to what they know i.e. Dim Sum, they could definitely get better! 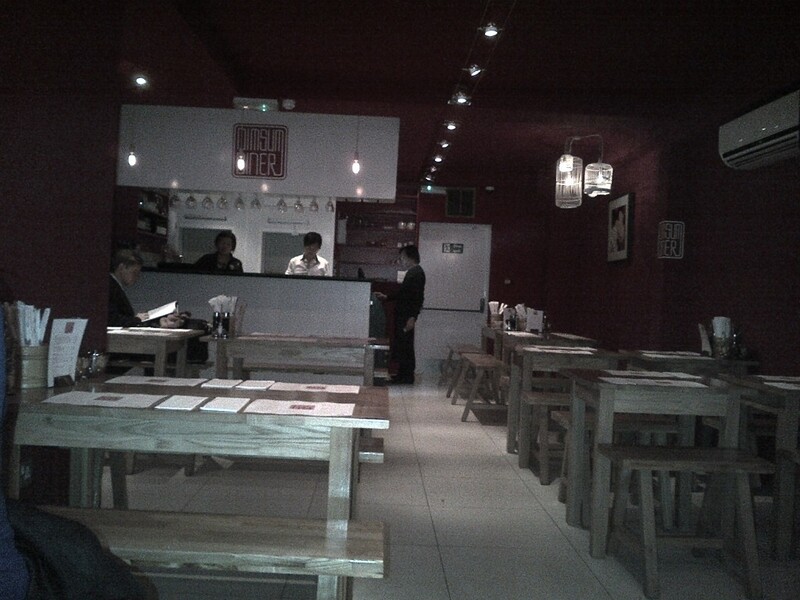 Miss R wasn’t very impressed with dim-sum diner but as Miss D said, its still early days!